Completed! Check back for our 2020 dates. 30+ Years of Homesteading, Growing Fruits and Vegetables for a living! "Deeply inspiring and hopeful" ♦ "Enlightening" ♦ "Moving"
Wondering about missing some hands-on activities at our Winter PDC compared to a summer course? Learning to use the A-frame and sight level. Building a dry-brick rocket stove and firing it up. Making a clay model of a landscape to learn about swales, keylining, and ponds. and touring the Malchow's (our neighbors) permaculture home to fire-up their thermal mass rocket stove couch/bench. The one thing we cannot do because of the frozen ground is continue to work on the hugel-swale we are constructing for CSC. This consists of digging a section of a ditch, putting logs in, and then covering them up. We'll show some pictures of the details related to this so you'll get the information without the tactile experience. The one thing we do extra for this course is focus a bit more on the growing of food and what it takes to create a successful farming/growing/permaculture operation. Many people want to make part or even all of their annual income from growing food. This is certainly possible but it requires quite a bit of knowledge and then real practical experience. Our objective through this training is to save you years of time and money by giving you some critical information and fresh insights. To help anchor this learning experience we'll be taking an extra field-trip over to Spence Farm in Fairbury, IL, to meet Will, Kris and Marty Travis who are doing pioneering work in these areas. If the timing works for you to attend this winter course we are confident that you will not leave feeling like you missed any hands-on activities. It's an amazing and very-full 8 days like all of our other PDC Courses. 1. Delivering the full PDC curriculum. 2. Learning how to transform back yards, city lots, roof tops and community commons areas into bountiful & beautiful gardens. 3. Making the business of food growing economically profitable, socially responsible and environmentally sound. 4. 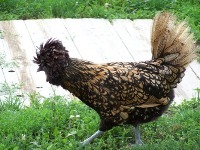 Looking at the serious alternatives to industrial farming. even with men of energy. I scarcely ever knew a mammoth farm to sustain itself..."
Our visiting farmers will be met either in person or over the internet. We have been bringing fascinating people into the classroom through the internet for a good while now and it is amazing how present the conversation becomes. We dialog back and forth, students asking any questions they like. It will really feel like the farmer is in the room. Kris, Will and Marty Travis's farm is a bustling center of activity with a wide array of heirloom and native crops, heritage animals, and a large diversity of agricultural opportunities on 160 acres. Kris, Will and Marty are committed to finding ways to make a living with a wide variety of farm crops and products and are amazing and creative farmers. For example, they found leeks growing wild in their woodlot and in one month sold over $20,000 worth. Chris and Marty started "Stewards of Land" about 9 years ago and have helped over 3-dozen other sustainable farmers become more economically viable. The work they are doing on their farm is admirable enough, but the work they are doing to build a community of farmers that can share costs, risk, marketing efforts and education/experience is their real gift. They will share with us how RELATIONSHIP, between people and business and plants and animals and the land (read permaculture), is the most important aspect of farming, family and community. 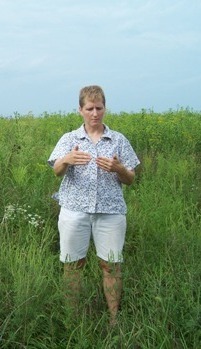 Kris explains the different transitions their prairie has gone through during their restoration project. 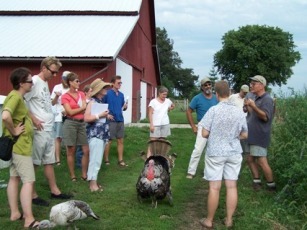 We hosted a live webinar a few years beck with Tom Galazen of North Wind Organic Farm. A two-hour webinar turned into 4 hours. Students of this course will receive a bonus link to this interview that includes much information about Tom's homesteading style of low energy consumption, how he approaches fruit growing and what varieties he highly recommends for different species of fruit. Tom has been raising a wide variety of fruits and vegetables on this farm for over 35 years. As much a homesteader as a farmer, he built most of the buildings on his farm and is off the grid. His specialty is in the growing and selling of a wide variety of fruits which are fitting for his location just a few miles from Lake Superior. Tom gets top-dollar for his produce through a local CSA and by retailing his goods right from the farm. Students receive access to download this interview upon registering for this training. Uncommon Ground Restaurant - Chicago Helen and her husband Michael had been restaurateurs for 19 years. Then they decided to open a second location for their successful restaurant and chose a building because of the large flat roof. 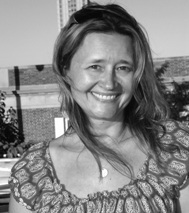 Helen wanted to grow at least some of the food and herbs that they serve to their customers.In the process, they decided to become organically certified and as a result became the first roof-top certified organic 'farm' in the United States. (Recorded Webinar) Donna and Robyn are the first we have heard of who run their farming operation from other peoples back yards. They have 53 'mini-farms'.And they don't rent peoples back yards, they charge the homeowners yearly to have much of their families food grown for them right in their own backyards. Robyn and Donna visit each home once a week, attending to all that is necessary, leaving a full basket of produce on the residents doorstep when the little farm starts producing.Homeowners can also learn how to grow their own food from these innovative and successful farmers. An insightful interview with Donna and Robyn is in one of your sessions from the "Foundations of Permaculture" webinar series. Depending up availability, there may be an additional grower or two that will share their experience with us. "In this Permaculture Design Certification (PDC) Course we want students to learn the skills of viewing a piece of property through a permaculture lens to be able to better see its gifts and challenges. From there a permaculture design can manifest. We will look honestly at the practical and financial realities of small-scale-sustainable farming and urban-food growing. As a younger man, Bill cut his teeth in farming when he started a 'pick-your-own' berry business in Kentucky. He learned much about farming and as much about working with others.Bill was also the community garden coordinator for several years in the small, sustainably oriented community or Stelle, IL, where he has lived for over 40 years. He and his wife/partner Becky have hosted and taught over 75 PDC courses and dozens of other permaculture workshops. "Bill, this was unequivocally the best educational experience of my life. You and the others made permaculture completely understandable and I am so inspired to implement this work. This training has tied it alltogether for me. Thank You. "Thanks so much for all your work!! I was so inspired by the course. I've already integrated permaculture into a community project I'm working on. After 25-yrs of landscaping, I needed that boost of BLISS!" If you landed on this page and happened to have missed the full description of the training, you might still be wondering what is actually covered in a certification course. If so, Click Here. and the 150-Question Study Guide. Within a week or so students receive the course textbook, via US Mail. This gem of a text, shipped to students upon registration, is written by Rosemary Morrow, an Australian, that has taught permaculture around the world for decades. The book is straightforward and loaded with illustrations and substance. It covers theory and also focuses on the practical aspects of how to create and implement a permaculture design. This book is a must read for the serious permaculturist and is a requirement for students of our design certification courses. To complement the text we have created a study guide with 150-questions that will assist the student in anchoring the information contained in the book. If a student can answer these questions to themselves, they can be assured that they have grasped the foundations of the permaculture design certification course. The on-site portion of the course begins on Saturday, March 2nd at 1:00pm and ends the following Saturday, March 9th at noon. Even though students will have already completed up to 20-hours of certification studies through the webinars, there are still 52+ hours of training ahead. To fit the balance of the curriculum into only 8 days along with meeting all of the farmers, the on-site portion of the course starts at 8:15am each morning and runs all the way through 9pm. There are long breaks for lunch and dinner... but students need to come prepared for a very full week of learning, designing, and fun. For all PDC trainings, students work on several short design projects in small groups to quickly develop their permaculture design skills. Personal Design Project Invitation: If one of the reasons you as a student might be taking this training is to learn the skills necessary to create a permaculture design for your own home or property there will be some time over the 8-days to make significant progress. We will show you how to locate topographical, soil, wind and watershed information from the internet and how to create your basemap. All meals, snacks, coffee, tea and water will be provided as part of the course tuition and will be served beginning with dinner on the first Saturday evening through lunch a week later. Meals will be prepared from mostly organic and locally raised foods and will include vegetarian and meat options. As part of the price of tuition, free camping space will be made available with toilets and showers nearby in heated spaces. This is a winter course however and one must be a very hearty and capable camper to deal with the cold and potentially stormy weather. We have relatively protective spaces for any campers should that be of any consolation. Remember, students will only be sleeping in their tents as all food is provided. The rest of the time will be spent in the classroom or on site tours. If you have a good sleeping bag and are familiar with winter camping, you'll be fine. Some of our fellow residents in Stelle are delighted to rent out their guest rooms for a modest fee for the whole week. All are a short walking distance from the classroom. Students can reserve a room when they register for the training. Questions? Please email Becky or call 815-256-2215. About 4 weeks before this training begins, students receive more information regarding what to expect, arrival details, what to pack, access to maps, etc. Students who complete this design course will receive a 'Certificate of Completion' from Midwest Permaculture which in the permaculture tradition, allows one to use the word 'permaculture' in the promotion of their work or business. Graduates may offer workshops, lectures and design services. Click here for more on certification. Price Includes 'Foundations of Permaculture' webinar series, 8-days of training, organically prepared meals, camping (oh boy...!!! 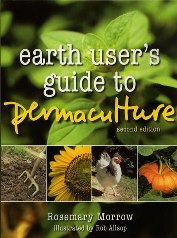 ), loads of permaculture related resources, and the networking site. 2 or more may register as a group and receive a $100 discount each. We've had friends, family members or couples register together and in the weeks before the course, bring in several more friends, everyone saving $100 each. If a student cancels their registration 30-days before the on-site portion a course begins they receive a full refund less $250. The student retains full access to all of the webinars, keeps the course resource links and text book, and receives a $195 credit towards any future Midwest Permaculture design certification course, good for up to 3-years. If a student cancels their registration in the 30-days before the course there will be a full refund less $350 and the student still receives the webinars and a $195 credit towards our design courses in the future. The credit is good for up to three years. There are no refunds for cancellations or for withdrawals once the course begins. However, in certain circumstances, we may extend partial credit toward a future design course. We have a separate website where all graduates can connect, share ideas and look for some assistance from each other. Graduates may audit any future PDC courses at half price (provided space is available). Our objective is to support our students for as long as they need it or want it and to encourage them to support each other. Already A Permaculture Design Course Graduate? We offer a 33% discount to students who have already graduated from another recognized course (from anywhere in the world) who wish to take a Midwest Permaculture course as a refresher. Please email for details. You are welcome to email us or call Becky at 815-256-2215. Our Group Photo with Rocket Stove in Foreground and Midwest Permaculture Home-site (our house). Mom (Becky Wilson) is standing on far left. Dad (Bill Wilson) took most of these pictures. Visit to Spence Farm - Fairbury, IL. It has been in the Spence/Travis family since the 1860's and has seen all the farming changes common over all of these 150 years. Kris and Marty Travis (standing) are moving Spence Farm into a diverse and polycultured income farm. For farm stability they feel one needs multiple income streams and really good relationships with fellow farmers and their customers. The raising of heritage breed hogs is an example of the diversity they are after. These piglets have already been promised to a restaurant in Chicago at a premium price. Wonderfully warm greenhouse for January starts. The sugar bush where Kris and Marty's son, Will, makes maple syrup each winter. Wayne loading up the rocket stove with wood to fire it up! Every PDC course we host visits Wayne and Bev's (his wife) home to learn about this stove, their strawbale garage, and many features of their permaculture yard. Notice how the fire is burning 'sideways' to the right? More on thermal mass rocket stoves here. Here is their finished stove just a month later with the final coat of cob and the cushions. Wayne took us all out to his garage (made from straw bales) to teach us how he made his cob from sand, clay and straw. There is a hole (now a small pond) where he got the clay from. Me teaching how to use an A-frame for finding contours. Students learning to use the A-frame. Milton building a rocket stove model to demonstrate thermal dynamics of this design. My dad (Bill Wilson) using a clay model to explain water harvesting techniques such as swales, ponds and keylining. Visiting one of our Swales. It's soaking in water, even during winter. 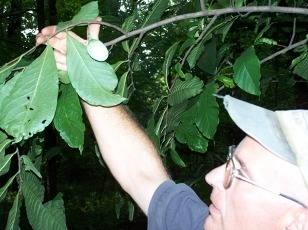 Orchard walk with grafting demonstration. Keep an eye on our schedule for this and other future trainings. We had a wonderful week together. Hope you can join us some year! Our work is to assist in bringing permaculture thinking into mainstream culture. We know it is possible for all humans to live abundantly well while also leaving the planet in better condition because we were here. That is the work facing the next three generations. Learn Permaculture at a project site we have been working of for 5 years now. Join us in learning about and supporting this wonderful project. "Thank you, Bill. This PDC course was pure gold. I recommend anyone who has a desire to make good things happen in this world to take it." How do things really work? There are no sacred cows. Permaculture explores multiple ways that we as humans can create real abundance, security and health for ourselves and the natural world... while similtaneously leaving the planet in much better condition because we were here. "Bill and Becky, my PDC Course with you continues to be utilized in my work and life even three years later. The training has deeply stayed with me."